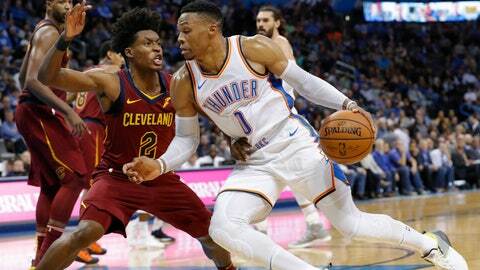 OKLAHOMA CITY (AP) — Russell Westbrook moved into a tie for third place on the NBA list for triple-doubles with 23 points, 19 rebounds and 15 assists, and the Oklahoma City Thunder completed a regular-season sweep of the short-handed Cleveland Cavaliers with a 100-83 victory Wednesday night. Westbrook’s triple-double was his third this season — all in the last four games — and the 107th of his career, matching Jason Kidd and trailing only Oscar Robertson (181) and Magic Johnson (138). Kidd took 1,247 games to reach 107, while Westbrook needed only 760. The 19 rebounds were one off Westbrook’s career high, set in last season’s finale against Memphis. Jerami Grant added 21 points on 8-of-12 shooting for the Thunder, who have won 13 of 16 after an 0-4 start. MILWAUKEE (AP) — Giannis Antetokounmpo had 36 points, 11 rebounds and eight assists, and Khris Middleton made a tiebreaking 3-pointer with 5.2 seconds left to lift Milwaukee over Chicago. Antetokounmpo and the Bucks (15-6) won an entertaining duel with former teammate Jabari Parker, who put up 24 points, eight rebounds and five assists in his latest return to Milwaukee. Parker signed with the Bulls last offseason after spending his first four NBA seasons with the Bucks. Malcolm Brogdon smartly passed the ball back to a wide-open Middleton at the top of the 3-point arc to set up the winning shot. Justin Holiday missed a 3 for Chicago that would have tied it in the final seconds. Antetokounmpo also had a crucial block of Parker’s shot with the score tied in the last minute. Brogdon had 24 points, and Middleton added 17. Rookie guard Ryan Arcidiacano scored 22 points but the Bulls (5-17) dropped their fourth straight game and eighth in the past nine. NEW YORK (AP) — Donovan Mitchell returned from a two-game absence with 29 points, taking over down the stretch and leading Utah past Brooklyn. Mitchell showed no effects from his bruised ribs, scoring 12 points in the final 5:42 to help the Jazz seize control of a close game. Rudy Gobert had 23 points and 16 rebounds for the Jazz, who bounced back from a miserable performance in their last game without Mitchell, a 121-88 home loss to Indiana on Monday. Mitchell scored mostly on drives into the lane but nailed a 3-pointer that made it 93-89. Spencer Dinwiddie had 18 points off the bench for the Nets, who dropped their season-high fourth straight. NEW ORLEANS (AP) — Anthony Davis had 28 points and 15 rebounds as New Orleans stemmed a four-game slide with a victory over Washington. Jrue Holiday scored 29 points and Julius Randle added 23 points and 12 rebounds for the Pelicans, who put Tim Frazier in the starting lineup at point guard and slid Holiday over to shooting guard. Frazier had 12 points and 12 assists in his third start of the season. Nikola Mirotic added 15 points and nine rebounds. Kelly Oubre Jr. and Markieff Morris each scored 22 for the Wizards, who trailed by 20 at halftime and never got closer than 11 in the second half. HOUSTON (AP) — Rookie Luka Doncic and Devin Harris each scored 20 points, and Dallas beat Houston despite a triple-double by Rockets star James Harden. Dallas used an 11-2 spurt to push its lead to 117-95 with seven minutes left, prompting Houston coach Mike D’Antoni to clear the bench. It’s the third straight win for the Mavericks and just their second victory on the road this season. Paul sat out for the third straight game after resting the first game and missing the last two with a sore left hamstring. MINNEAPOLIS (AP) — Robert Covington scored 21 points, and the Timberwolves earned their fourth straight win. Minnesota (11-11) reached .500 for the first time since Oct. 31. Karl-Anthony Towns and Derrick Rose each had 16 points, and Taj Gibson finished with 13. The Timberwolves had dropped 14 of their last 15 against San Antonio, but it held the Spurs to 39.5 percent shooting. Jakob Poeltl led San Antonio with 14 points, and Marco Belinelli had 11. PHILADELPHIA (AP) — Joel Embiid put on a show with his father in the stands for the first time this season, collecting 26 points and 14 rebounds while leading Philadelphia to the victory. Embiid’s spin move into a one-handed jam earned a smile and applause from Thomas Embiid, a colonel in the Cameroon military who is visiting from the family’s home country and plans to spend a few weeks with his MVP candidate son. JJ Redick hit four 3s and scored 24 points for the 76ers. Ben Simmons had 14 points. Enes Kanter and Mario Hezonja each scored 17 points for the Knicks. The Knicks have played nine of 12 games on the road and were coming off a 115-108 loss to Detroit on Tuesday. CHARLOTTE, N.C. (AP) — Jeremy Lamb scored 22 points, Cody Zeller had a season-high 19 and Charlotte avenged a loss to Atlanta. The Hawks topped the Hornets 124-123 on Sunday night at home when John Collins blocked Kemba Walker’s shot at the buzzer. But this one wasn’t close. Charlotte (11-10) limited Atlanta to 34 percent shooting from the field to move back above .500 on the season and improve to 8-3 at home. Hornets star Kemba Walker, who came in averaging 27.9 points per game, finished with 19 points while battling through an off shooting night. He was 6 of 19 from the field and 6 of 10 from the foul line. PORTLAND, Ore. (AP) — Damian Lillard had 41 points, including a franchise-record 10 3-pointers, and Portland held off Orlando. Jusuf Nurkic added 16 points and 13 rebounds as the Trail Blazers stopped a season-high three-game slide. Lillard surpassed the previous Portland record of nine 3s that he shared with Nicolas Batum. Nikola Vucevic had 20 points and eight rebounds for the Magic, who have lost four of five. CJ McCollum hit a tiebreaking 3 down the stretch for the Blazers. Lillard’s floater with 55 seconds left gave Portland a 113-110 lead. Orlando played without Aaron Gordon, who was sidelined by a sore lower back. LOS ANGELES (AP) — Danilo Gallinari had 28 points and 10 rebounds as Los Angeles won its ninth straight home game by defeating Phoenix. Lou Williams scored 20 points while Tobias Harris (18 points, 10 rebounds) and Boban Marjanovic (12 points, 12 rebounds) notched double-doubles for the Clippers (14-6), who have the NBA’s longest active home winning streak and have won 10 of their last 12 overall. Phoenix is off to the worst start in franchise history at 4-17. Devin Booker led the Suns with 23 points.